Ender Inciarte had a quality first year with the Braves that has now resulted in a nice five year $30.5m contract for the Venezuelan centerfielder. Thanks to Jason Hanselman (@sandykazmir on twitter) of The Process Report, a tremendous Rays blog, I will be using a really cool spreadsheet to analyze our hitters compared to the rest of the league. Inciarte will be the first I will be looking at, but I will take a look at all of the relevant hitters for the Braves over the next few weeks. For reference, GAGR is a stat Hanselmen created that stands for “Great Approach, Great Results” and can be detailed here. If you have any questions about any of the other stats, please feel free to reach out via twitter, but most are available on the FanGraphs library via a quick google search. The areas of strength in Inciarte’s season are the heavily green shaded areas, while the areas he struggled in are the heavily shaded red areas. Again, I cannot thank Jason enough for making this as simple as possible to outline for us all. 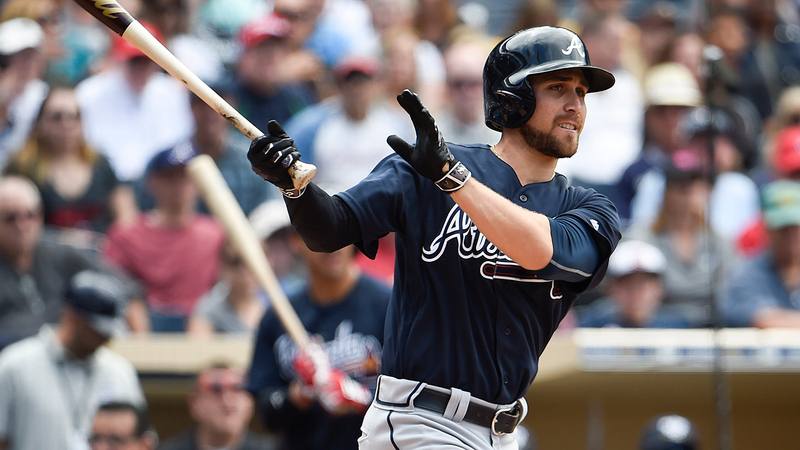 Inciarte’s most notable offensive skill is his ability to make contact. This is evident in his O-Contact%, Z-Contact%, Contact%, SwStr% and K%. He’s in the 94th percentile or better in all of those statistics, and it is rather easy to point to his exceptional ability to put the bat on the ball as the driving force behind his offensive success. In fact, nobody in the game is better than Inciarte at hitting pitches that are outside of the zone. When a player is so confident that they can hit basically anything they swing at, that often leads to a higher overall swing percentage. This is something we became accustomed to with Andrelton Simmons. These types of players are so good at hitting all types of pitches that they both swing more often and make contact more often, which unfortunately leads to lower walk rates than their pitch recognition skills would suggest. When we look at this chart we can basically boil down Inciarte’s approach. As he understands what he does well and does not do well, he is able to use his contact skills to wait on pitches and take them the other way much more frequently than most players. His pull percentage is extremely low while his opposite field percentage is extremely high compared to the average hitter. He is basically dead even in terms of pull percentage vs. oppo percentage, which is very rare. The opposite field approach leads to much less hard contact. Inciarte’s average exit velocity in 2016 was 86mph, which was about 3.5 miles per hour lower than league average. Pulled balls are generally hit harder, and his self-awareness of his lack of power leading to the up-the-middle/opposite field approach will inherently produce fewer hard hit balls. What is interesting is that he still maintains a high line drive percentage despite a low hard hit rate. This correlates with the above statement. The up the middle and opposite field one hoppers to outfielders are line drives but are not necessarily hard hit balls. For most players, a low exit velocity and a high BABIP would signal concern that the BABIP was not authentic. But with Ender that does not seem to be the case, especially when we consider his base running skills (96% in UBR). The combination of high line drive rates, ground ball rates, and speed make the elevated BABIP seem much more legitimate than one would immediately assume. Combine that with the fact that he had an identical BABIP the year prior, and projection systems defaulting to a closer-to-league-average BABIP seem to be over-generalizing. Inciarte has the profile of a player that should continue to maintain high BABIP’s annually along with high averages. Inciarte’s overall offensive game is unlikely to develop much more. He may bulk up and hit for more power in his prime years, but the likelihood is that he either replicates this type of production or improves slightly in the areas he already succeeds in. By that, I mean, he could continue to hone in on his current his approach and hit even more singles via soft liners and seeing-eye grounders. But overall, I suspect league average offense is the type of player we should be expecting in Inciarte. Combine the league average offense with elite center field defense and base running and we wind up with probably the second best player on the roster after Freddie Freeman. It continues to come up in almost every conversation about the overall outlook of the Braves moving forward, but boy did that Shelby Miller deal really pay off. Getting a player like Inciarte that is not only very skilled but that has a great understanding of his skills as an additional piece to Swanson just seems unfair.